Demonstrate the properties of radioactive decay safely in your lab. This Cs-137/Ba-137m Isotope Generator is used to conduct experiment in schools and universities to demonstrate the properties of radioactive decay. Based on the original Union Carbide patented design, it offers exceptional performance combined with ease of use and safe operation. Each generator contains 10uCi. of Cs-137 which represents one Exempt Quantity making if free from specific State and Federal licensing. 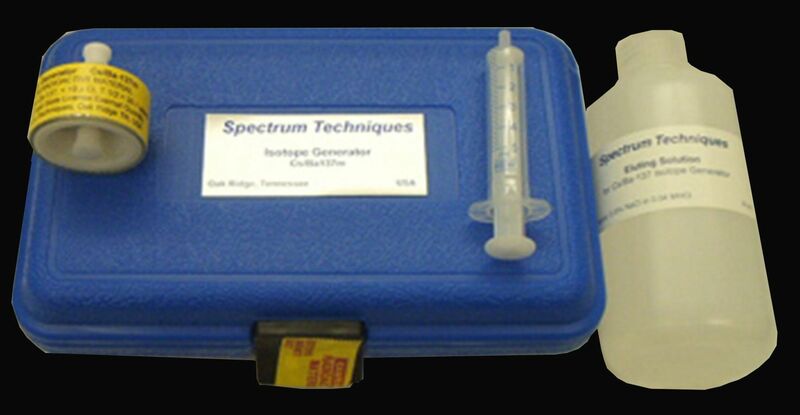 The generator can produce up to 1000 small aliquots of the short lived Ba-137m isotope with a half-life of 2.6 minutes. Each generator is supplied with 250 ml of eluting solution (0.9% NaCl) and additional solution may be ordered separately. The parent isotope Cs-137 with a half-life of 30.1 years beta decays (94.6%) to the metastable state of Ba-137m. This further decays by gamma emission (662 keV) with a half-life of 2.6 minutes to the stable Ba-137 element. During elution, the Ba-137m is selectively ""milked"" from the generator leaving behind the Cs-137 parent. Regeneration of the Ba-137m occurs as the Cs-137 continues to decay, re-establishing equilibrium in less than 1 hour. Approximately 30 minutes after elution, the residual activity of the Ba-137m sample has decayed to less than one thousandth of its initial activity making it safe for disposal. When used with the eluting solution supplied, bleed through of the parent Cs-137 is less than 50 Bq/ml, affording a long working life. Ordering information: Each kit is supplied with the generator, syringe, tube, 250ml of eluting solution and a convenient storage case.